The Fellowship was fortunate enough to obtain a copy of THE RIDE: SOUTHERN GOTHIC #1 from 12-Gauge Comics. Nathan Edmondson, Jody LeHeup and Ron Marz write, and Paul Azaceta, David Lapham and Rick Leonardi draw. This oversized book contains three separate stories, each one dark and sinister in its own way. The first shows us the consequences of a crime of passion, the second shows how badly a heist can go wrong, and the third starts an ongoing tale of revenge and the effects it can have on everyone involved. This title heralds a return to the concept of the pulp comic, and I think it’s a good start. It’s not so much the depth of the stories themselves; they are very short stories, after all. The point is the tone and the flavor of the style that really brings it home to the reader. The idea of fast and loose, wild and free living (and dying) in a really sweet set of wheels, stickin’ it to the Man or takin’ the bull by the horns; it’s an idea that has a great deal of appeal to some readers. And the artistic style also helps make that point; it’s good, solid black and white artwork. I find this concept an exciting one because of the way it goes completely against what’s popular these days, and it does so very well. It’s definitely worth a read. 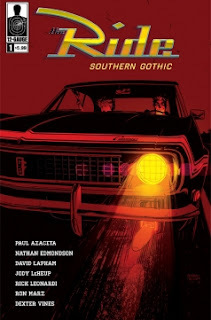 THE RIDE: SOUTHERN GOTHIC #1 is available now at your FLCS or by order from 12gaugecomics.com.